Images from the set of the horror sequel have surfaced online. Suspense is building for the sequel to megahit horror reboot It, and we finally have a first look at everyone’s favorite dancing clown. While the images aren’t studio sanctioned, the behind-the-scenes look is still making us even more stoked for It: Chapter Two. Some photos of actor Bill Skarsgård (or possibly a stunt double) in full Pennywise gear were posted by Just Jared. The images show the clown floating down on several wires and scowling once he hits the ground. The cast is currently filming in Canada, and local news organization Northumberland News spotted the actor atop a Paul Bunyan statue in Port Hope Memorial Park in Ontario. The site details that the temporary statue is a replica of the one in Bangor, Maine, which is home to It author Stephen King. A Paul Bunyan statue makes an appearance in the novel as Pennywise takes the shape of the statue in order to terrorize the Loser Club’s resident jokester Richie Tozier, so this could potentially be that scene. The 2017 adaptation of King’s It quickly became the highest grossing horror movie of all time, surpassing 1973’s The Exorcist just two weeks after its release. It earned an impressive $236.3 million stateside with The Exorcist grossing in $232.9 million, making It the highest-grossing horror film domestically. 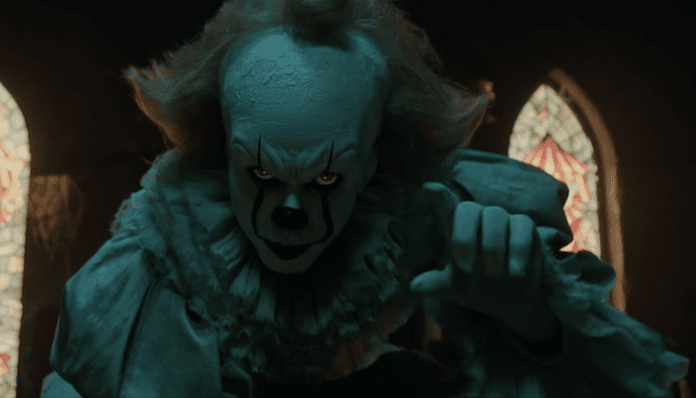 The film’s success had Warner Bros. and New Line announcing a sequel less than three weeks after the first one’s opening and later announced Andy Muschietti was returning to directing duties. After many rumors and wish lists, the adult version of the Losers Club was confirmed with a photo from the film’s official Twitter account, which includes Jessica Chastain (Beverly Marsh), James McAvoy (Bill Denbrough), Bill Hader (Richie Tozier), James Ransone (Eddie Kaspbrak), Jay Ryan (Ben Hanscom), Andy Bean (Stan Uris) and Isaiah Mustafa (Mike Hanlon). Muschietti regularly shares photos of the cast on set, and he recently took to Instagram to post a photo of Chastain doused in blood. It: Chapter Two is set to release September 6, 2019.